What makes Google AdWords different from a magazine, newspaper, radio, outdoor advertising? You only pay when someone clicks your ad, visits your website or calls you directly. You’re in complete control to set your own budget, 90% of our clients increase their budget on Google AdWords after the first 30 days based on the results they receive. Google AdWords has become one of the most valuable, cost effective, measurable methods to build a client base and most importantly, drive sales. It allows you to measure return on investment extremely accurately. The best way to see performance is by measured and to-the-point reports. With a complete list of all inquiries received, and direct sales from your business (resulted from the online campaigns) allows you to see all the information you solely need, allowing you to focus on your business. We're very transparent with our reporting and results, through our cloud based software you can monitor your campaigns from anywhere in the world at any time. Measuring the source of where inquiries come from gives us the information to present exactly what you need to know....'is the campaign making profit?'. By monitoring in conjunction with the sales team we can determine how many inquiries are coming from our online efforts, allowing you to measure the performance of the campaign. We personally visit and train your team on how to handle inquiries, not only with speed (speed stuns, the quicker we respond the quicker we can convert them before someone else does, and most important leave a GREAT impression). We all agree that the tonality of a person over the phone makes all the difference whether you want to go to that business or not. Besides speed and quickly responding to an inquiry, how we perform the call and convert them to visiting your business / 'qualifying them is very important to save both time and energy with each lead', we help train your team to answer and deal with all possible outcomes and responses from your potential clients. Once a campaign is set-up and running in the very first few days we're able to see which additional terms and keywords we can target that customers are searching, giving us more reach and areas to capture your perfect clients. Creating a landing page which is not only SEO optimized to help reduce your cost as much as possible, but also user friendly to convert customers. Landing page(s) convert on average 20-30% more than someone going directly to a website, we create landing page(s) that are not only unique but deliver results and high click through rates i.e. the amount of people visiting and converting is high. Making sure your campaign’s keywords are correctly managed i.e. with low cost-per-clicks and likewise the ad copy is attracting customers not only by appearing at the top of the page of Google (above your competition) but also in such a way it drives people to be curious enough to click and inquire about our landing pages. This is where you get to know us, and we get to know you! We learn everything there is to know prior to starting a campaign to thoroughly understand your business. When creating a new campaign from scratch, we have various methods and opportunities available to create a perfectly functional and results driven campaign. We will recommend and suggest the best options to move forward. Determining your goal is crucial for the campaign to be effective. As our sole purpose is to make this nothing more than a success and growing source of benefit for our client's business. Our primary focus is to understand your requirements, goal and aspirations for your business. Based on this we create a plan specifically to achieve nothing but the highest success for your campaign(s). Choosing the correct keywords allows us to be displayed not only to the correct audience but to search terms that are cost effective. A detailed study of all possible keyword options will be researched and presented to you. Studying the specifics of your direct competitor’s plans and strategies is essential for campaign success. Measuring both opportunities and risks involved in campaigns help tremendously with overall campaign set-up. 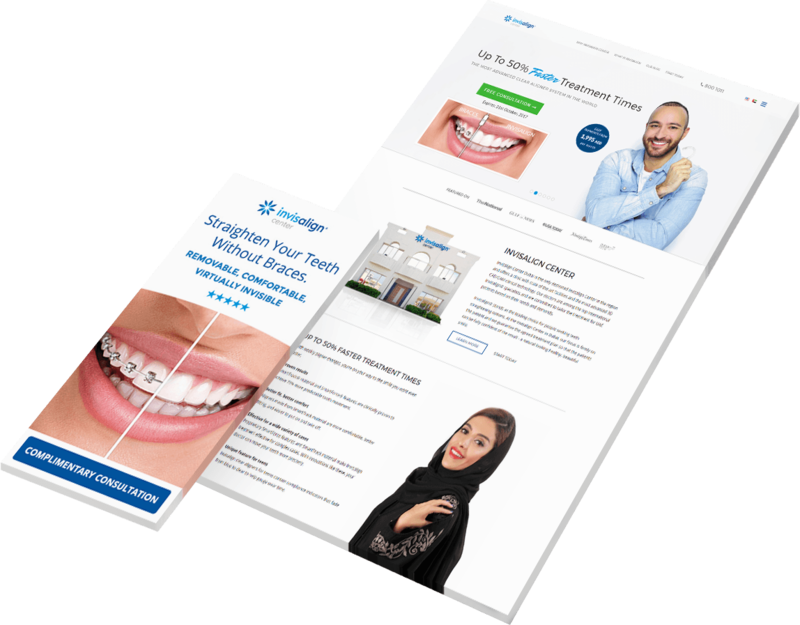 Invisalign Center was a newly opened clinic; the goal to increase their amount of clients looking for teeth straightening solutions and choose their aligned over general regular braces. Increase in sales year on year. Increase in quality of patients. 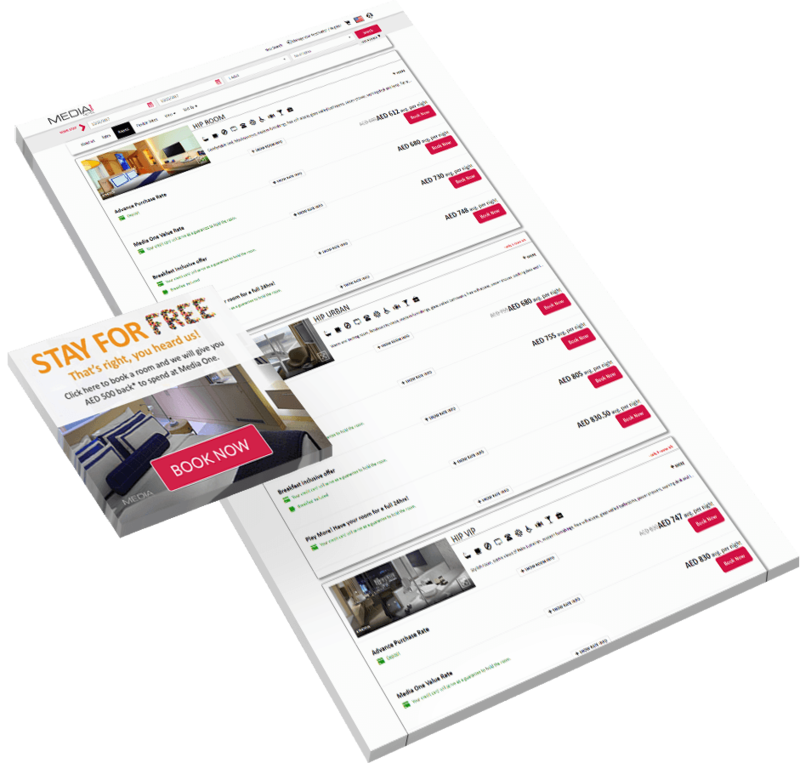 Media One Hotel’s objective was to increase the amount of direct sales on their website instead of customers choosing 3rd party websites. Targeting customers across the region. We’re a closely knitted family. Our team brings a wealth of experience from the world’s most formidable industries. We all have one common goal. – Bringing “SMILES” to our clients. Ready to work with us? Let’s connect. What's the difference between PPC and Organic SEO? Pay Per Click ads or paid ads are those located on the extreme right, top or bottom part of a search results page. On the other hand, rest of the results that follow vertically are non-paid listings or organic results. The organic listings gain prominence on the web through Search Engine Optimization techniques such as website content and link building operations. Does it pay to be #1? Most of the time. However, being #1 on a search engine does not guarantee success. Measuring your campaign’s success is critical. We provide measuring and reporting in clear and precise terms against your return and investment. A landing page can be defined as a destination page on which the visitor (your potential client) land after clicking the paid ad. On average a landing page converts 30-40% more than somebody visiting your website. Yes you definitely do, and it should be well designed as well. A perfectly oriented landing page carries your campaign further by explaining your goods and services to your target audience who clicked on your ad in the first place. Landing pages if created properly have the potential of converting a visitor into a customer. Can you set a budget? Budgets are determined prior to starting a campaign and are managed by our certified PPC team daily. What should I look out for in a bad Google Ads company? There are many PPC providers locally & globally, a company to watch out for is anyone that says: “You can get unlimited clients “or “ Be No.1 on Google 24/7”. If you have any questions, wish to know more , call us directly. Do you want to be seen by customers at the very moment they are searching? Then you need to get your ad on Google. When customers are looking for the things you offer, they will click on your ad. Each time they visit your site or click, you have to pay. If they don’t, neither do you. Why Google ads, you may ask? If you want to attract new visitors to your website, retain old customers with something new or grow online sale Google ads will benefit your business. You can advertise locally or internationally and target customers in different cities, regions and even countries. With Google AdWords you can reach potential customers in the same location or broadcast outside of your demographic. First, set any budget, this all depends on the size of your business and what you plan to accomplish. Google AdWords is nimble. While organic search engine advertising may lag behind for weeks in the hope of changing the behaviour of targeted audiences, pay per click advertising can change the behaviour in hours or days. Your business will have an unparalleled ability to adhere to market conditions and change customer interests. Google AdWords can be thought of as a bargain. You will sometimes find a fantastic deal to bid for top keywords or phrases which are longer and highly specific. These are long-tail search terms and not pursued by everyone. This makes pay per click a great option as you can advertise to your targeted traffic at a fraction of the cost compared to other paid advertising methods. If you are running a short term campaign to advertise a new product or service, Google AdWords will help quickly generate buzz. Once you start the campaign, within 48 hours, you can adjust the message if you want to mid-campaign. PPC is perfect if you need your ad to generate traffic for a limited time. Google AdWords is also great if you sell a product or service which can be purchased immediately when people visit your website. A great example is online stores. Clicks are generated by potential customers so it makes sense to spend money, increase the number of clicks and stay prominent to gain high return on investment. If you want to generate traffic for a specific keyword or key phrase you will often get bargains from PPC. For instance, you might not want to spend on the top bid for the term jackets, but women’s black jacket or blue jacket will be less expensive. Consider long-tail search terms here. Google AdWords allows you to group together people who have visited your website, at least once. You can target these prospects with customized ads, which can include video ads. You know there are visitors who have seen your products and services but who haven’t yet bought from you. Remarketing is cost effective and will help increase the bottom line. The rule of thumb? Focus and look at Google AdWords as a paid form of advertising similar to other advertising methods. It is proactive, it is clear and has a quantifiable goal in mind, either short or long-term. Whether you are a new or an experienced user of PPC — we can help. To put it simply Pay per click (PPC) is a proven form of online advertising that you, the advertiser, only pay for when someone clicks on your ad. Talk with one of our Google certified marketing professionals about how to get more out of your marketing online.